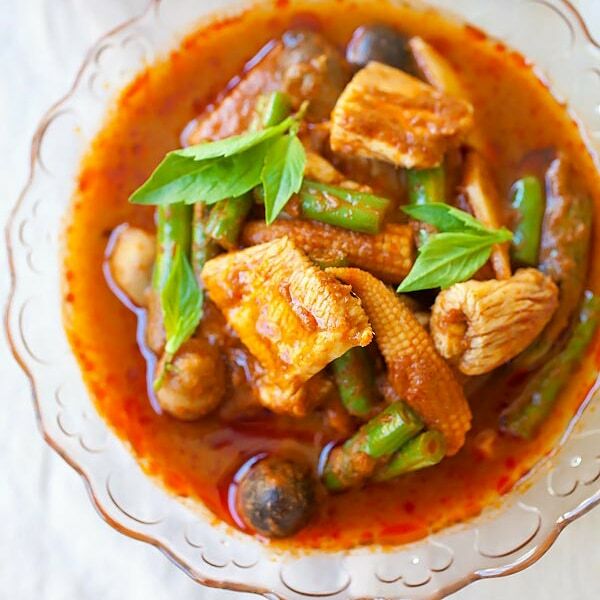 Jungle curry is a popular Thai curry. Jungle curry is spicy, with no coconut milk. You can make pork or chicken jungle curry with this easy recipe. Heat up a wok and add in the water, red curry paste, galanga and rhizome (optional). Stir to combine until boiling. Add the pork and let it cook for 1 minute. Add the fish sauce and sugar. Stir to mix. Gently transfer the bamboo shoot, baby corn, straw mushroom, string beans and kaffir leaves into the wok. Stir to mix. Cover the wok and bring to boil. Turn the heat to medium and let it cook for 5-6 minutes. Add in the basil leaves. Give it a quick stir and cook for 2 minutes. Jungle curry is a popular Thai curry. Jungle curry is spicy, with no coconut milk. You can make pork or chicken jungle curry with this easy recipe! Fall/winter is the best time to have curries. Nothing warms me up quite like a pot of fiery hot, spice-laden curry. I grew up with all sorts of curries back home in Malaysia: chicken curry, fish curry, squid curry, etc. And then I discovered Thai curries, which are rather different, delicious nonetheless. Anyway, I am sure you have seen Jungle Curry on the menu at Thai restaurants. To be honest, I have never had jungle curry, even though I dine out at Thai restaurants quite often. I always order the usual red curry, green curry, or yellow curry. Recently, I decided to try Jungle Curry and actually liked it. It tastes different because it’s not as “creamy” and sweet because there is no coconut milk added in the curry, and hence the spices taste more pronounced, which is a great thing is my culinary dictionary. Jungle curry, or kaeng pa, according to Wikipedia, is a curry originated from the northern part of Thailand. As coconuts are not found in the region, it contains no coconut milk. It was originally prepared with wild boars found in the jungle. I made this jungle curry with pork. If you can’t eat pork, feel free to substitute with chicken. The curry goes extremely well with rice. Heat up a wok and add in the water, red curry paste, galanga and rhizome (optional). Stir to combine until boiling. Add the pork and let it cook for 1 minute. Add the fish sauce and sugar. Stir to mix. Gently transfer the bamboo shoot, baby corn, straw mushroom, string beans and kaffir leaves into the wok. Stir to mix. Cover the wok and bring to boil. Turn the heat to medium and let it cook for 5-6 minutes. Add in the basil leaves. Give it a quick stir and cook for 2 minutes. Serve with rice. 1. Rhizome is optional but may enhance the flavor of this dish. 2. This is the red curry paste I used for this recipe. Sorry but what is rhizome? you wanna give me a clue on the rhizome ingredient? Can’t wait to try this since it seems like a light, thin curry. I’ve always wanted to try a curry without coconut milk since I’m also paranoid about the unhealthiness of coconut milk. But can you post pictures of the galanga and rhizome you used? I have no idea what they are or where to find them. Me too. I use canned fat free evaporated milk and some coconut flavoring–I actually like it better because it’s not as heavy as coconut milk. Rhizome as in ginger? Or galangal? I think the rhizome is lesser ginger. The Thai name is krachai and temu kunci in Indonesian. According to Wikipedia it also goes by fingerroot, Chinese ginger and the botanical name Boesenbergia rotunda. From what I gather your best bet is to check the frozen section of a Southeast Asian market. It looks delicious! I can’t wait to try it. Thanks for this recipe Bee. I’ve discovered I don’t really care for coconut milk but I do like the spicy Thai curry pastes and it is nice to find an authentic recipe that doesn’t use coconut milk. 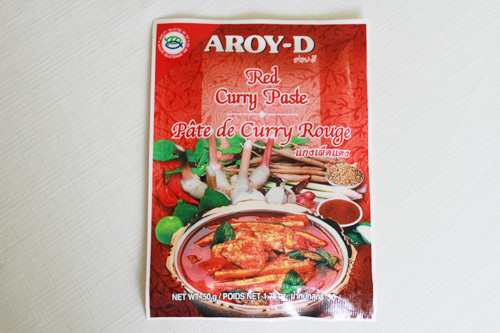 I have used the Aroy-D green curry paste and quite like it so I am looking forward to trying this. This looks delicious, I love the flavour of krachai. I love coconut milk but you don’t miss it in jungle curries. Im cooking this right now and it smells amazing! Maybe I’m overlooking it, but where do the green beans come in? Hi Sterling, thank you for trying this recipe. Sorry, I’ve updated the post. The green/string beans come in with the other vegetables. Bee, I couldn’t find the single pack in my local asian market, but was able to get a whole jar. How many tea or tablespoons do you think on pack is? never mind, I hadn’t read the label 4Tbl/cup liquid, It was a huge hit, thanks! I am not not too sure. Can I use fish in the recipe instead? Which one would you recommend? Yes you can or chicken. Yay – we have krachai in Australia.